Leaders from North Korea and South Korea officially agreed to end their war. North Korea and South Korea have agreed to denuclearize the peninsula and later this year formally end the war between the two nations that began in 1950. The nations signed an armistice when the fighting ended in 1953, but they've now agreed to pursue a proper peace agreement tied to the "common goal of realizing, through complete denuclearization, a nuclear-free Korean Peninsula." Kim Jong Un, the leader of North Korea, has pledged a "new history" with the South Koreans. Together with South Korean President Moon Jae-in, he has agreed to work on a permanent peace agreement and work toward a "complete denuclearization of the Korean peninsula." "We talked about peace and prosperity," Moon said. "A bold decision has been made. Big applause should be given to Kim Jong Un." Moon called the meeting "historical" and "a valuable time." To achieve a complete peace the two nations will collaborate and "change the order of the Korean peninsula." 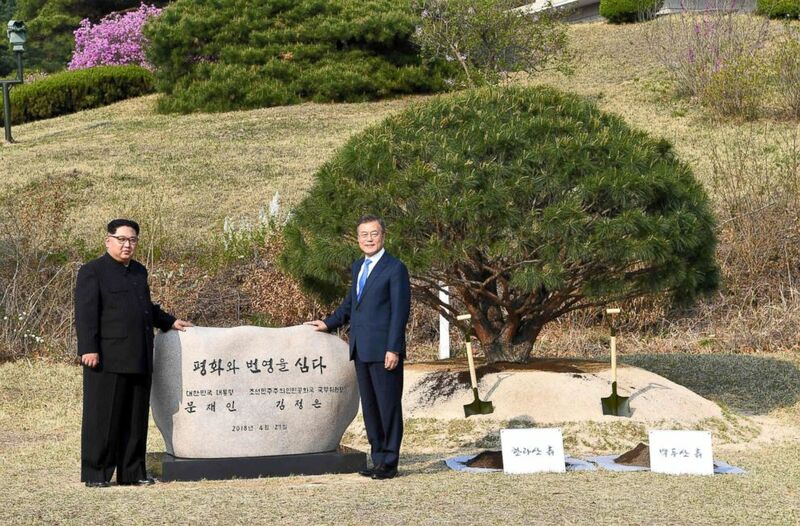 (Korean Summit Press/AFP/Getty Images) Kim Jong Un and Moon Jae-in participate in a tree-planting ceremony next to the Military Demarcation Line that forms the border between the two Koreas at the truce village of Panmunjom, April 27, 2018. Moon also said this process included "a bold and courageous decision" by Kim and that the two leaders "have confidence in each other." "There is no turning back," he added. Kim similarly praised Moon, saying this moment has been a long time coming. "Same people, same blood, so we cannot be separated and should live together in unification," Kim said. "I hope we live together soon as a new path forward." With the rest of the world watching, he added, "We will never repeat the past mistakes." (Korean Summit Press/EPA via Rex/Shutterstock) North Korean leader Kim Jong-Un talks with South Korean President Moon Jae-In at the Peace House on Joint Security Area (JSA) on the Demilitarized Zone (DMZ) in the border village of Panmunjom in Paju, South Korea, April 27, 2018. 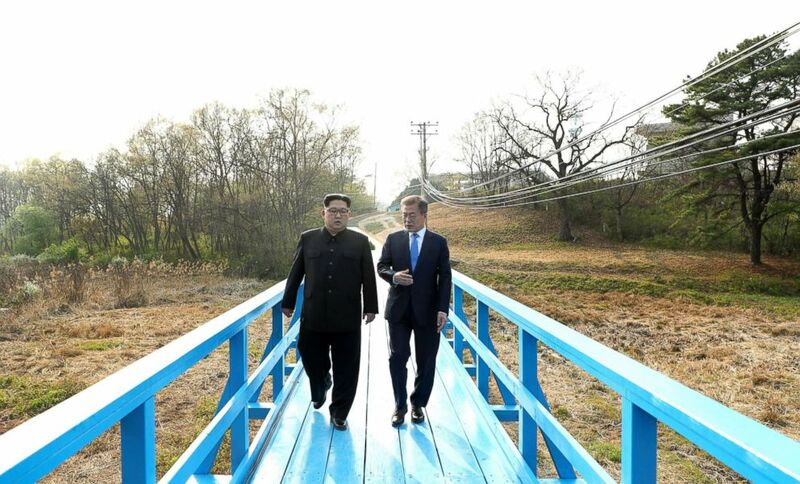 The event-packed day was well choreographed, providing emotional and video-friendly moments including a red-carpet honor-guard review, planting a pine tree together, sharing a walk in the Demilitarized Zone and then a lengthy private talk at a picnic table on a newly painted bright blue bridge. The two men spoke for more than half an hour as media watched from afar. 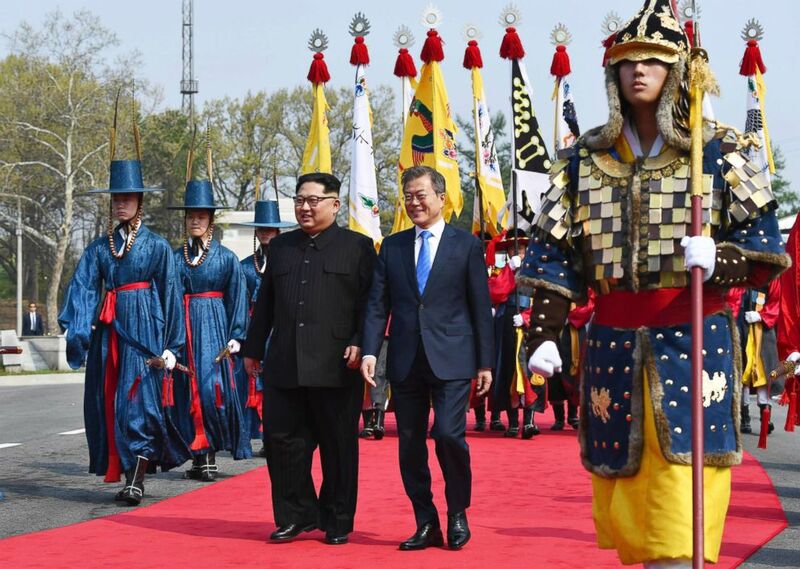 Perhaps the day's biggest highlight was when Kim, wearing a black Mao suit, first appeared in the morning, walking from the North size of the DMZ to meet Moon at the border with the South. It was the first time a North Korean leader stepped on South Korean soil. Shortly thereafter, Moon said to Kim, "You've come to the South today, when can I go to the North?" Kim responded: "Why not try now?" Holding hands, as more than 3,000 journalists, mostly from South Korean looked on, the leaders jumped across the boundary. (Korea Summit Press Pool via AP) North Korean leader Kim Jong Un and South Korean President Moon Jae-in walk together at the border village of Panmunjom in the Demilitarized Zone, April 27, 2018. Kim made history Friday by crossing over the world's most heavily armed border to greet his rival, Moon, for talks on North Korea's nuclear weapons. Kim and Moon may request three-way talks with Washington or four-way talks that include Beijing to convert the armistice from 1953 into a peace treaty, hopefully by the end of this year. Both nations have agreed to expand civilian exchanges and pursue join sporting and cultural events. Family reunions may happen in mid-August, an anniversary for both nations' celebrating liberation from Japanese colonial rule after the end of World War II.